It's Wednesday, and you know what that means: it's time for brunch. No. Well, yes and no. It's time to obsess over last week's episode of Gotham, if you haven't already done that. If you have, then sit back and let me obsess. Trust me, I'm a professional at it. This week's episode, "Mandatory Brunch Meeting," follows three storylines: Jerome's search for a man named Xander Wilde, a battle of wits between Lee Thompkins and the Riddler, and Penguin's attempts to re-enlist Butch as his henchman. Warning: the following episode contains suicide, violence, and a rabid bag of rats (okay, that last one didn't actually make it onscreen, but the rest did). Also, I know I say it every week, but this episode contains some SERIOUS SPOILERS. Seriously, if you haven't been keeping up with this season, you might want to steer clear of this recap. This episode has some major twists that won't be as good if you can see them coming. And now, without further ado, let's get into the recap. Plot A: Prepare for Trouble . . . and Make it Double. The episode opens with Bruce walking down a hallway with his vigilante gear on and his brooding mode in full form. He enters a door marked "headmaster's office." Inside is the headmaster, who stands with his back to Bruce. Bruce introduces himself and explains that he's looking for Jerome Valeska. The headmaster replies that he didn't meet Jerome but instead spoke to a man in a top hat. Bruce surmises that it must've been the Mad Hatter. Bruce asks what Hatter wanted, and the headmaster replied that he was looking for information about Xander Wilde, a bright student who graduated 10 years ago. When Bruce asks why Hatter was looking for Xander, the headmaster replies that he doesn't know . . . but that Hatter had a message for Bruce. The headmaster then turns to reveal a bomb strapped to his chest and a detonator in his hand. Bruce tries to talk him out of detonating the bomb, but the hypnotized headmaster insists that the Hatter is counting on him. Gordon and Harvey then rush in, telling Bruce to step away. He informs them that Hatter must've hypnotized the headmaster, and Gordon shoots a nearby clock, hoping that its tick is the sound that triggers the trance. However, the headmaster, who's wearing a pocket watch, detonates the bomb, and Bruce runs to get out of the way. He, Gordon and Harvey escape unscathed, but the headmaster dies in the explosion. Apparently, the Riddler wasn't invited to this little shindig. Maybe Jerome was worried that the Riddler would be one of the few people capable of figuring out his entire plan (and sabotaging it, if he wanted to). Or perhaps the Riddler is seen as a second-rate villain among the underworld's elite, thanks to his humiliation at the end of season 3. It looks like Firefly didn't die in "Stop Hitting Yourself." I guess guns are only an effective means of murder if the character in question doesn't have plot armor. Also, Firefly's original actress, Michelle Veintimilla, is back (in season 3 and the first part of season 4, the character was portrayed by Camila Perez). However, the discontinuity between actresses isn't that jarring, thanks to Firefly's scarred face and the goggles that, when worn cover the upper half of her face. Jerome explains that he needs the help of each villain in the room to turn the city into a madhouse. Jerome then asks Scarecrow how the "you-know-what" is coming along. Scarecrow replies "dreadfully" (translation: wonderfully). Next, Jerome tells Mr. Freeze that he needs a lab. Freeze replies that it should be easy enough. Jerome says that all they need now is for Hatter to return with the information about Wilde. Firefly asks how Jerome plans to take over the underworld, but Jerome replies that he could care less about that. He says that he just wants to "paint the town crazy" and doesn't care what happens to Gotham afterward. Firefly says she's in, but Penguin looks increasingly disturbed by Jerome's desire for chaos. However, he remains silent, and Hatter arrives with the information. Back at the school, Gordon asks Bruce (now accompanied by Alfred) who Xander Wilde is. Bruce replies that if he knew, he'd tell Gordon, but Gordon asks how he can even trust Bruce at this point. Gordon then asks if Alfred knew that Bruce was going after Jerome on his own. Alfred says yes, yes he did. Nice going, Alfred. Gordon tells Alfred that if Bruce gets involved again, he will press charges. After Alfred and Bruce leave, Harvey tells Gordon that he talked to an administrator, who said that Xander was a child prodigy who became an engineer at Meyer and Heyes. Jerome, however, is one step ahead of them and has already reached the headquarters for Meyer and Hayes. He greets the secretary with his usual charm. She runs off to fetch security, though Jerome says not to bother, as they're all headless. He then strolls into a meeting. "I've got a business proposition," he announces. "Tell me what I want to know, and you won't get turned inside out." He then asks where Xander Wilde is. When a businessman replies that he's not at the meeting, Jerome retorts that he's not blind. The man explains that Xander never comes into the office; he only communicates with them through a proxy. Jerome laughs at the idea that Xander thinks he could hide from him before asking where to find the proxy. When Gordon and Harvey arrive at the Meyer and Heyes building, the businessmen (and women) are running for their lives. Jerome greets Gordon and quickly heads behind a wall for cover. Gordon yells at him to drop the gun, but Firefly enters and uses her flamethrower to distract Gordon and Harvey while Jerome escapes. Later on (and after Firefly has also, presumably, escaped), Harvey tells Gordon that none of the employees have ever met Xander. He only communicated through a proxy, and the only one who knew the proxy was Hayes (who's now in a body bag, thanks to Jerome). Gordon states that Jerome's whole plan, up to this point, has been about finding Xander. He surmises that Jerome must have personal history with the man. As he contemplates the theory, he notices a photograph of Wayne Plaza, autographed by Xander himself. Gordon realizes that Xander must've designed the building, which means someone at Wayne Enterprises might've met him in person. Harvey points out that this means they have to talk to Bruce, who'll be less than happy to see Gordon. Meanwhile, a woman enters her apartment with groceries. Jerome slinks out of the shadows and asks if she brought any ice cream. She replies that she was wondering when he'd come, and Jerome asks where Xander is. The woman replies that she'll never tell, but Jerome pulls out a knife and says that he can be pretty persuasive. However, she gestures at an empty cage and asks if he's been wondering what it's for. When Jerome admits that he did wonder that, she says it's how she plans to transport him. She then punches him out, calls someone on her cellphone, and informs the person on the end, "I've got him." Over at Wayne Manor, Harvey and Gordon ask if Bruce and Alfred have any information on Wayne Plaza that might be connected to Xander Wilde. Bruce, of course, can't help but point out that they've come to him for help on a case they told him to stay away from. Alfred, however, grabs Thomas Wayne's notes on Wayne Plaza and sees that Thomas met with Xander, alone, at Amesley Drive. Bruce remarks that Xander must be important if his father met with him alone, and Gordon says he thinks Xander became a recluse to hide from Jerome. Speaking of Jerome, he regains consciousness only to discover that he's in a small metal room with no apparent exits. He notices a camera and laughs at it. "Oh, you are incorrigible," he says. "But then again, you always were. Or was that me?" The black and white camera feed of Jerome zooms out, and a man watches it on a video monitor, his back turned to the audience. Jerome taunts him from the cell, first saying he doesn't want to hurt Xander, and then saying he'll squeeze him till he pops. On another camera feed, the man watches Gordon and Harvey arrive at the outside of his hideout. From the outside, it looks like a plain metal shed. Gordon presses the intercom button, announces himself, and asks to see Xander Wilde. He opens the door, and the proxy from earlier leads them through an underground bunker. She explains that Xander values his privacy, and unlocks a door by speaking her name: "Ecco 496." She then leads Harvey and Gordon to Wilde, who's now turned off the security feeds. He turns to introduce himself, which leads to a shocking reveal. 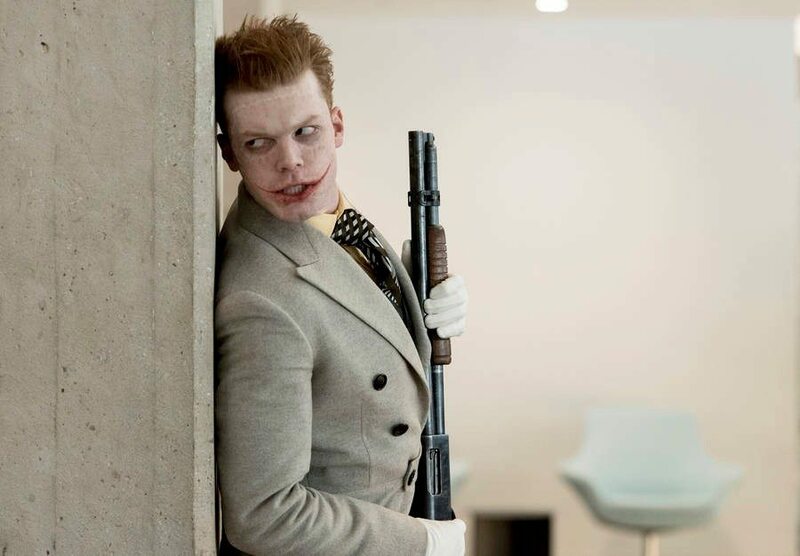 I'm not gonna lie; I knew this was coming (it'd been announced that Cameron Monaghan would play two characters at the end of season 4), but it was still a thrill to see him taking on the role of "Xander Wilde." Xander then explains that his real name is Jeremiah. He thanks Gordon for solving his mother's murder and for arresting his brother, Jerome. Gordon notes that Jerome never mentioned he had a brother. Jeremiah says it makes sense; his mother's letters said that Jerome never spoke of Jeremiah after he left the circus. Jeremiah explains that despite their identical features, he and Jerome were always very different. Jeremiah was skilled at maths and design, whereas Jerome was skilled at mutilating animals. Jeremiah says that when they were ten, Jerome held a cake knife to his throat and set his bed on fire a few weeks later. One night, Uncle Zack took him away from the circus and sent him to St. Ignatius, where he got a new name and a new life. In spite of that, Jeremiah always suspected that Jerome would come for him one day. Harvey says that that day is today, and Gordon adds that they need to make sure Jeremiah is safe until they've apprehended Jerome. Jeremiah insists that he's safest inside his home and says that the proxy name he gave to Hayes was a fake. Gordon doesn't believe him and asks why his video monitors are turned off. Jeremiah tells him not to touch his equipment, but Gordon switches the monitors on. The feed from Jerome's cell shows him performing stretches and waving at the camera. Jeremiah tells them that the GCPD and Arkham couldn't hold Jerome, but he can. Gordon insists that Jeremiah give him Jerome. Before they can argue about it further, Harvey points out that the video feed shows Scarecrow and Hatter walking down the hallway with Ecco. The building's alarms begin to sound, and Gordon asks if there's another exit. Jeremiah says they can't leave Ecco; she's devoted her life to keeping him safe. Gordon says that they need to focus on getting Jeremiah out first, then they'll come back for Ecco. Jeremiah accepts this and reveals that he designed the bunker to be a nigh-inescapable maze. Jeremiah leads Gordon and Harvey through the halls and explains that as a kid, he was fascinated with labyrinths. The maze he created is a 100-acre maze with 42 dead ends. Only one other man managed to find his way out, and it took him three days. (Side note: I'm loving this maze, but it also makes me wish we'd gotten the Court of Owls' maze from the comics last season.) As he leads Gordon and Harvey through the maze, they run into Ecco, who's hypnotized. She fights both of them, takes them down, and grabs Jeremiah. He begs her not to take him to Jerome and insists that his brother will do horrible things to him. Harvey and Gordon catch up with Ecco and manage to free Jeremiah from her grip, leaving him free to run to a neon sign marked "the end." However, when he reaches the end, Jerome emerges. Jerome says he's been waiting for this day for 15 years, ever since Jeremiah ran away like a coward. Jerome then yells at Hatter and Scarecrow to kill Gordon and Harvey. Jeremiah says that he always knew Jerome was crazy, but their mother wouldn't listen. He adds that Jerome can't blame Jeremiah for his problems, because he was simply "born bad." Jerome asks if that's why Jeremiah made up the story about Jerome trying to kill him. "What was it again?" Jerome asks. "What was it? I put a blade to your throat . . . no, no, no. I tried to light you on fire." Jeremiah protests that even though he didn't exactly tell the truth, they both knew Jerome wanted to kill him, so Jeremiah didn't have a choice; he had to tell their mother a lie so that she'd finally believe that Jerome was crazy. But I digress. Jeremiah points out that Jerome did kill their mother, but Jerome says she deserved it. After Jeremiah left, she turned everyone against Jerome, and no one ever cared about him again. Meanwhile, Hatter approaches Gordon and Harvey, intending to hypnotize them. Harvey, however, has a particularly effective method for stopping Hatter. At the end of the maze, Jeremiah asks what Jerome's going to do to him. The answer is simple: kill him, but not before driving him mad, along with the rest of Gotham. Before he can explain further, Scarecrow and Hatter sprint past. As Gordon and Harvey approach, Jerome puts a gun to his brother's head and threatens to kill him. Gordon points out that if Jerome wanted his brother dead, he'd have killed him already. Jerome admits that he's right, drops Jeremiah, and runs off. Gordon and Harvey chase after him, but they exit the building only to find that the woods are empty. They take Jeremiah back to the GCPD to put into protective custody, after explaining who he is to Detective Harper. Gordon asks Harvey how Jerome could possibly be planning to turn the city mad. "I don't know," Harvey replies. "I thought it already was." Back at Penguin's mansion, Jerome shoots one of the Arkham escapees, before remarking to Firefly that it doesn't make him feel any better. Scarecrow enters and announces that the test subject has arrived. Butch enters, and Penguin quickly clarifies that he's not the test subject; he's a new addition to the team. Jerome rolls with it, saying that Butch is a big, scary guy who could prove useful. Hatter then brings in the actual test subject, an unnamed businessman. Scarecrow sprays him with purple gas, and the businessman begins to laugh wildly. As he laughs, his skin turns deathly pale and his mouth stretches into an unnatural grin. Jerome laughs back and says they'll need more of the gas. That's right, everyone: Scarecrow just invented Joker Venom, the iconic gas that makes people laugh until they die with white skin and a smile on their faces. Plot B: Ask a Stupid Question. In a Narrows warehouse, the Riddler walks onto a stage, surrounded by green lighting and a crowd. "What time is it?" he asks. "Riddle time," the crowd responds. The Riddler agrees, saying it's "Riddle Time" at the Riddle Factory. He introduces his first contestant Lars, a former member of the Three Demons gang (which, I'm pretty sure, was the biker gang the Sirens robbed in 4x07). The Riddler reminds Lars and the audience of his rules. First, you have to answer the Riddler's riddle. If you get it right, you ask your own. If it stumps him, you win a cash prize. The Riddler then tells his assistant, Lila, to prepare the timer, which is a giant hourglass filled with green sand (I need to know where he got that. For . . . reasons). The Riddler then asks his question: "Forwards I'm heavy, backwards I'm not. What am I?" and Lila turns over the hourglass. After a few seconds of deliberating, Lars says that the answer is the hourglass. The Riddler says he's wrong: it's the word "ton." The crowd then shouts, "Spin the wheel!" Lila obliges, waltzing over to the Riddler's "wheel of misfortune" and giving it a spin. It lands on "rabid sack of rats," and the crowd cheers. However, before Lars can be forced into the sack, someone yells, "That's enough!" It's none other than Lee Tompkins. The Riddler asks what brings her to his game. She replies that she hasn't seen him since they froze Penguin, then asks how he's doing. He pointedly remarks that he's doing better than Sofia Falcone. Lee then cuts to the chase: she's shutting down his game show. The Riddler asks the crowd how they feel about that, and they boo. The Riddler agrees to Lee's deal and announces to the crowd that they've got their next contestant. After Lila preps the timer again, the Riddler presents his riddle: "I can be broken without being held, given and then taken away. Some people use me to deceive, but when delivered, I am the greatest gift of all. What am I?" As Lee thinks, he gloats, saying that she's stumped. She admits that she is, but refuses to give up. She says that she doesn't need to figure out the answer; he'll give it to her because, deep down, he wants to. The Riddler replies that there's no used appealing to the inner Ed. Ed Nygma is gone, and the man who's left refuses to be manipulated. Lee replied that she never manipulated or mistreated Ed, but the Riddler says she did. She promised to cure Ed and didn't keep her word. With 10 seconds to go, Lee announces that the Riddler revealed the answer to her, just like she said he would. She admits the Riddler's right; she said she'd cure Ed and she never did. In other words, Lee broke her promise. And that's the answer to the riddle: a promise. The Riddler applauds her answer but says the game's only halfway over. Now she has to ask him a riddle. After thinking about it, Lee presents her riddle (and as she does, a reprise of her theme plays). "What three words are said too much, meant by few, but wanted by all?" she asks. The Riddler scoffs at the simplicity of the question, but when he tries to answer, he stops himself. He says she's trying to trick him by "awakening a love that isn't there." Lee says that if he doesn't love her, the words should be easy to say. He refuses to say the words, and the crowd boos. The time runs out and the crowd cheers. The Riddler walks offstage, defeated. Later on, the Riddler returns the empty warehouse and spins the wheel absentmindedly. As he does so, Lee enters and asks why he set up his game in the Narrows. He could've set it up anywhere, but he must've chosen the Narrows to get her attention. The Riddler denies it, saying he came to the Narrows because the people there love him. Lee retorts that they don't love him, they just came for the money. She says that she can help the people of the Narrows get what they want if he helps her. He asks why she expects him to help her, and Lee replies that she can give him what he wants. When he stays still, Lee asks what the Riddler's record is for how many banks he's robbed in one day. Three, he says. She replies that she thinks he can do better. The Riddler then tells her that she's playing a dangerous game. She responds "I know," before passionately kissing him. Started from the bottom . . .
. . . Now we're here. After the mandatory brunch meeting, Penguin goes to a dark bar where he finds Butch sitting at the counter. Penguin's eyes widen as he takes in Butch's new appearance, but he quickly claims that he likes the change. Butch asks what Penguin wants. Penguin responds that Butch has probably heard about the Arkham breakout (you know, if the droves of people who almost committed mass suicide weren't enough of a hint that something was up). Penguin tells Butch that after Jerome flames out, Penguin plans to take back the underworld and he needs a good man by his side. He insists that with his brains and Butch's strength a takeover would be easy. Butch says no; he's already done that job more than once. He's his own man. Penguin retorts that Butch has nothing. He says that the two of them ran the town once and they can run it again. Butch, however, grabs Penguin by the throat and yells that he's wrong. Penguin can have his old life back, but Butch can't, and Tabitha will never love him again. He then tells Penguin to leave. Penguin promises to help Butch find Strange if he (Butch) joins Penguin's side. Butch agrees but makes it clear that he's not Penguin's friend. Penguin replies, "I can live with those terms." Plot A: I've said it before, and I'll say it again: I don't know how Cameron Monaghan hasn't won an Emmy for his acting on Gotham. Ever since he dropped his shy, vulnerable act and broke down laughing in the interrogation scene of "The Blind Fortune Teller," I've been convinced that Monaghan is the best possible actor to play a young Joker. He's got this charismatic energy about him; even when he's about to hurt someone, you just can't look away. The Joker is a showman, a liar, a psychopath, a would-be comedian, and a manipulative mastermind—and Monaghan plays each one of those roles to a T.
And then, in this episode, he flips it all around to play the scared, fidgety, intellectual Jeremiah . . . all the while dropping hints that there's something darker lurking under the surface. 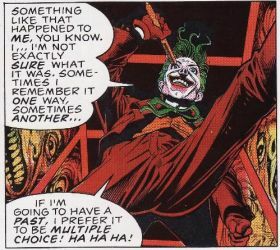 The unsolvable mazes, the intention to keep Jerome locked up, the lies about his brother's attempts to murder him—each of these points imply that Jeremiah will become the Joker. I might've had my doubts about the effectiveness of the "secret twin brother" plot twist, but this episode changed my mind. Jerome and Jeremiah have one thing in common: they're both masterminds. And when you consider the contingency plans Jeremiah put in place to both escape and catch his brother, along with his affinity for traps and puzzles, you can't help but think, Gotham city is in trouble if this man becomes the Joker. And unless Jeremiah is a gigantic red herring (a possibility I'm willing to consider), he will become the Joker. As the Joker says in The Killing Joke, "All it takes is one bad day to reduce the sanest man alive to lunacy." One of the upcoming episodes of this season is literally titled "One Bad Day." That, combined with the invention of Joker Venom and promo photos that have been released (don't click if you dislike spoilers), implies that Jeremiah will become the Joker. As for the rest of the cast in this plot, I think everyone played their parts well. It's funny to see any scenario where Penguin is the only sane man, and that seems to be his role in this team-up. Also, the background hijinks of Scarecrow and Hatter's partnership continue to be hilarious. I can't wait to see what this "legion of horribles" does next, especially if Jerome dies in the episodes to come. Plot B: This is going to sound odd, but I'd like to give a shoutout to the costume designers of Gotham. See, here's the thing about the Riddler in this episode: in some scenes, he's wearing his bowler hat. In others, he's not. This particular hat is a symbol; the decision to don it in "How the Riddler Got His Name" marked the full emergence of the Riddler persona. His decision to discard it prior to "Reunion" (only donning a few similar hats in "Stop Hitting Yourself") was an outward sign of Ed's belief that he was no longer capable of being the Riddler. If that hat's on, the Riddler's in control, but if it's gone, all bets are off. When the Riddler presents his question to Lee, the hat is on, but when she presents her riddle, it's off. I think its absence is a sign that Ed Nygma is resurfacing. And when Lee confronts Nygma after the game's over, his hat's gone again. The Riddler can't suppress Nygma's feelings for her, and his control is slipping (if it isn't already gone altogether). Speaking of control, this plot raises an interesting question: to what extent is Lee controlling or manipulating Ed in this episode? I'd say her actions in the game show were fair play, but it's the final scene that makes me wonder about her intentions. The episode makes it clear that Nygma has feelings for Lee, but does she care for him in the same way? Sure, they've been friends for most of this season. Sure, he was her right-hand man in the Narrows. But that doesn't change the fact that he killed Kristen Kringle and framed Gordon for murder. Is Lee willing to forgive those crimes to the point where she could fall in love with Nygma? Or is she using his love for her as a way to control him? Her words at the end (about giving Nygma what he wanted, as long as he helped her) implies that she's leveraging his affection for her. I'd like to believe that she might love him back and was trying to save Nygma (not just enlist him), but it's more than possible that she's using him. I also have to hand it to Morena Baccarin and Cory Michael Smith; it's not easy to compete for attention in an episode dominated by Jerome-centric plot, but both actors played their roles perfectly. Each scene between them had a tension that built until the very end—and then it climaxed in one amazing kiss. Bravo. Plot C: I'll be honest; this is probably the part of the episode that slowed it down the most. Given the exciting developments of Plot A and B, I didn't really care about what was going to happen with Penguin and Butch. It's always the same story. Penguin's in power, Butch gets mistreated, Butch turns on Penguin, Penguin loses power, Penguin regains power, Penguin gets Butch to work for him again. At least this time, Butch made it clear that he refuses to act like Penguin's friend. And after everything Butch's been through, I don't blame him. He got tortured, brainwashed, had his hand chopped off, and watched his girlfriend's hand get chopped off. It's been a rough four years for Butch Gilzean. But I'll be frank: I think that Gotham bit off more than it could chew when it added Solomon Grundy to the show. I don't think they originally planned to turn Butch into Grundy; they probably just wanted to justify keeping the character around and wanted the added bonus of a comic-book twist. And I'd be fine with it if the character was executed well—but he's not. Grundy is the sort of character that's not easy to portray on a TV budget. Gotham's been using makeup instead of CGI, and it's more tacky than scary. Also, in comics such as The Long Halloween, Grundy is a tragic character because no one knows where he came from or who he used to be. All he ever says is parts of the old nursery rhyme, in the same way that Groot only ever says "I am Groot." Grundy hides himself in Gotham's sewers because the world sees him as a monster. You feel sorry for him because you don't know who he used to be, and neither does he. In Gotham, you've always known "Grundy" as Butch Gilzean. That becomes the main reason for your investment in this version of the character. If Drew Powell had never played Butch and was only cast as Solomon Grundy, the character wouldn't be nearly as compelling. This version of Grundy (in his hazier episodes) had clunky dialogue and was almost treated as comic relief. That being said, I think Gotham has two good options, given that Grundy (or Butch in Grundy's body) just isn't working. Either they turn Butch back into Butch, or kill him. Personally, I favor the latter option. While I miss the old Butch, I think it'd be a bad idea to just turn him back into himself and act like the whole Grundy thing never happened. Killing off the character is the cleaner option. Looking back, it's probably what they should've done at the end of season 3, but I supposed if they had, the fight club plot would've been lacking a fighter, so there's that, at least. Overall verdict: This was an amazing episode. If I had to grade it, I'd give an A-, if only for the fact that Plot C was pretty boring compared to the other two amazing storylines. I know this is probably a longer review than usual, but I think that's due to the quality and depth of this episode. Every scene with Cameron Monaghan was an absolute delight, thanks to both the references to Joker mythology and the new spin of Jerome having a brother. When I see episodes as meticulously crafted as this one, it annoys me that most superhero fans don't give Gotham the time of day. This is a show that weaves its own mythology. It borrows some elements from certain Batman stories, but it also manages to subvert the audience's expectations. And let's not forget the performances of Monaghan, Smith, and Baccarin. These are actors who know how to create tension and play off of other characters (and, in Monaghan and Smith's case, they can talk to themselves and still be captivating). But enough gushing. Suffice it to say that the back half of Gotham: A Dark Knight continues to both entertain and astonish me. But what are your thoughts? Comment below with your opinions. What do you think about Jeremiah Valeska? Who do you want to become the Joker? How do you feel about Lee and Nygma's relationship? Come back next week for a recap of episode 18, entitled "That's Entertainment." Until then, lock up your underground bunkers and get out your gas masks. With Jerome on the loose, no one's safe.